Survey after survey show the same findings: Millennials rate traditional supermarkets lower than all other generations. In an industry with razor-thin margins, this dissatisfaction could prove costly for grocery stores as other concepts and online competition elbow in on Millennials. Adding or revitalizing offerings in these areas can make a big impact on the bottom line for supermarkets. A key part to each of these areas is lighting. Good lighting moves merchandise and drives foot traffic, while bad lighting turns customers away. Here’s how supermarkets can harness LED lighting to lure in Millennials and capitalize on both their food-at-home (FAH) and rising food-away-from-home (FAFH) dollars. Millennials are known for their tech-savviness and they are getting more and more comfortable buying groceries online. Indeed, 55 percent plan to shop for groceries online if they aren’t already (IRI). However, the silver lining for supermarkets is what Millennials will and won’t buy online. Millennials understand that fresh doesn’t come out of a mailed package and they are willing to go to great lengths (visiting three stores or more) for the freshest foods, according to an Acosta 2017 “Trip Drivers” report. The items Millennials are least likely to buy online, according to the Food Marketing Institute, are fresh bakery items, fresh meat and seafood, and fresh produce. More than any other generation, Millennials love fresh fruits and vegetables, according to the USDA. Those are also high-margin products, which is good news for supermarkets. Selling produce comes down to color quality. Nothing says “fresh!” like color. Vibrant hues are the key to sending the message—think bright red tomatoes and lush green leafy veggies. Sunlight is the light our eyes tend to appreciate the most and it’s the light source we compare all others too. Artificial light sources have historically struggled to replicate how colors appear under natural light. Halogens are warm-tinted and they project heat, while metal halides, early LEDS and fluorescents deliver flat colors. With Fresh Color LEDs, you can finally bring the sun into your store. The natural colors of fresh food burst forth under these LEDs. With LED lights, your produce looks like it came from the farm that morning. Light falls on a spectrum and conventional light sources emit light at fixed points along the spectrum. Since LEDs are made from electronics, they can be tuned to showcase the natural colors in fresh foods. LEDs can bring out the “garden fresh” appearance of fruit and vegetables, while highlighting the cool silver scales of the fresh-caught fish. The Fresh Color LED lights don’t change the colors of food; they show the foods’ natural true color and highlight the freshness of the product. This enhances your shoppers’ perceptions of fresh, which is the key to luring millennials, who especially appreciate value in products. Millennials are eating out more than older generations. A study from the USDA found Millennials eat at restaurants and bars 30 percent more than Gen X’ers, Baby Boomers, and Traditionalists. This dovetails with Millennials’ noted fondness for experiences over owning things and also explains Millennials’ lower overall FAH purchases compared to other generations. 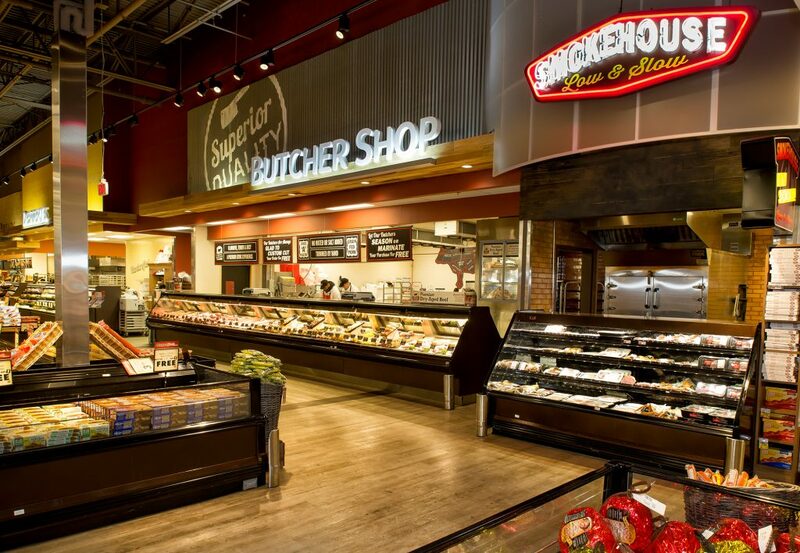 Successful supermarkets are leveraging these preferences by opening “grocerants”—in-store hospitality areas like coffee shops, restaurants and/or bar options for shoppers. A recent report found spending in this category accounted for $10 billion in 2015 and is poised to grow. These eateries can help grocery stores capture Millennial dollars that would otherwise flow to restaurants instead. The key to successful in-store cafes is to light the area differently than the rest of the store. When lit with comfortable warm-toned lights, hospitality spaces stand out across the store and beckon to shoppers with promises of relaxation. LEDs, which offer superior control and significant energy savings, are now able to glow warm, just like incandescent lamps. Warm lights designate the café as something different from the dry goods aisle and makes the space feel like home. In-store hospitality spaces tell a story of grocery shopping as a relaxing pursuit and make customers feel like they are being treated special. 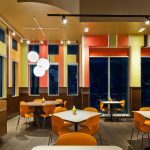 Setting the right tone in the space is critical to making customers feel welcome and that’s best done through warm-colored lighting. Supermarkets that elevate their fresh food presentation and shopping experience with the latest LED technology will be rewarded with Millennials’ money. With Millennials on the cusp of dethroning Baby Boomers as the largest living generation, that’s a big pile of cash up for grabs. 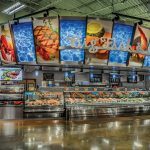 See how Amerlux can enhance your supermarkets with the very best LED lighting.